How many images have you seen like these: many. But don´t tell me you get tired. 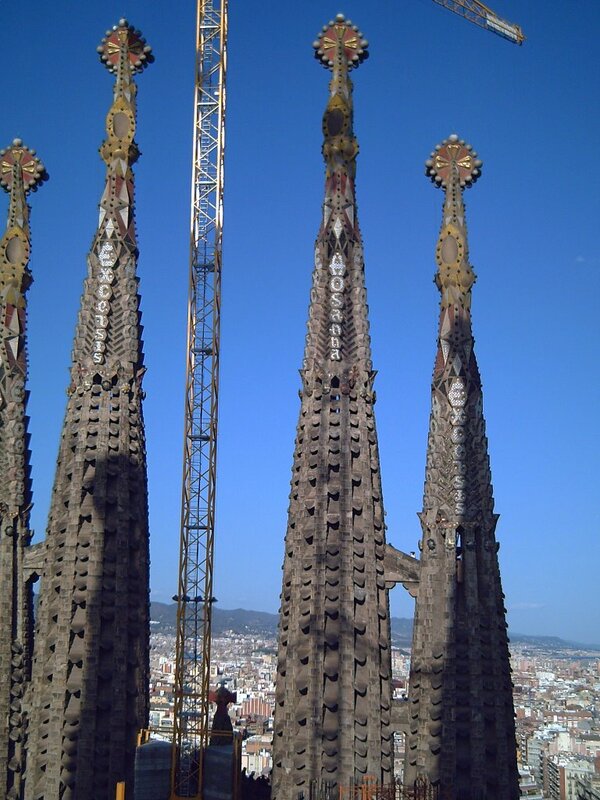 Did you know that neither this generation nor next will see Sagrada Familia finished? Did you know that the money to continue Gaudi's work does not come from the government or from taxes but only from donations and the entrance charge? Notice in front of you that there is someone standing in a sort of corridor between the spires, well I am standing with my camera in a similar spot but in the newer towers closer to the Passion Façade. I had no idea the spires were so big!!! And that the money is only from private donations...Is this because it's a church and not a public building? The sky is so Blue - just gorgeous! just exquisite work of art ! i got to read up more about this ..thanks ! >Sam: Yes it comes from private donations as it was meant that way since the beginning. There is a canonical private foundation created by the end of the XIX century always linked to the most illustrious families of the city ,still represented there. This foundation is presided over by the archbishop of the city. When tourism emerged the income increased and now it represents 95% of the funding. In 1992 only, workers built more than had ever been done before in the temple. >Fotoaddict: There is a lot of information about it, but I try to sum up a little. Photos oblige. >Yes it is kind of dizzy because the beauty. You get a little used to it but the first time it is a pleasure for the senses. I saw a documentary about it one time! Magnificent edifice, the documentary showed a japanese man who is working there.He is one of the people in charge of making statues of angels. > Hello, midnitebara: Oh I did not know. Japanese people are fond of Gaudi's art. They are good connoisseurs. Great shot Carlos. I have never enough to see La Sagrada Familia. This is an exceptional art work, even unfinished. The towers are amazing too, even if I have vertigo when I stand where those people are, but what a great view of the city from up there. I've heard about this but never seen it, cool shot. what are the words on the spires? Thanks for the link Carlos. Aren't the top of the spires covered up at the moment for restoration ? I tell you Carlos, your pictures bring back a lot of fun memories of my time in Barcelona. La Segrada Familia has such a view from the top. You are are so blessed to have Gaudi. All his buildings...And the park! Do me a favour please? Could you take a picture of La Concha? It was the one place I didn't bring my camera to. Please? >Thanks Karine, I swear it is not scary at all. The wall of the corridor is high and you are protected all the time. The view is great, coz you can see the sea and the mountains.By the way I like your profile picture. >Hosanna in Excelsis. This is what you can read. It is part of Sanctus in a Mass. Check this link to know more "http://en.wikipedia.org/wiki/Mass_(music)". Thanks Lisi, I think this way we can all learn something more. >My friend Bob, you are welcome. I took this picture last month. I remember that some spires were covered but these I think can be seen uncovered, unless they change them recently.I have another picture with the lower part of the façade full of that awful green plastic net and cranes seem to have been there for ages. (with no photo) which is a bar. If it is let me know and I'll see what I can do. But I guess you know already. Yes, you are right. that's the beach. The place I'm refering to is a bar just off La Ramblas. My friends took me there. I now can't remember the name. I only remember that it is decorated with posters of a very famous Spanish actress (forgot her name too!) I'm sorry for my failing memory. Oh, and I love Cafe de L'Opera (is that right?) and churros with chocolate.